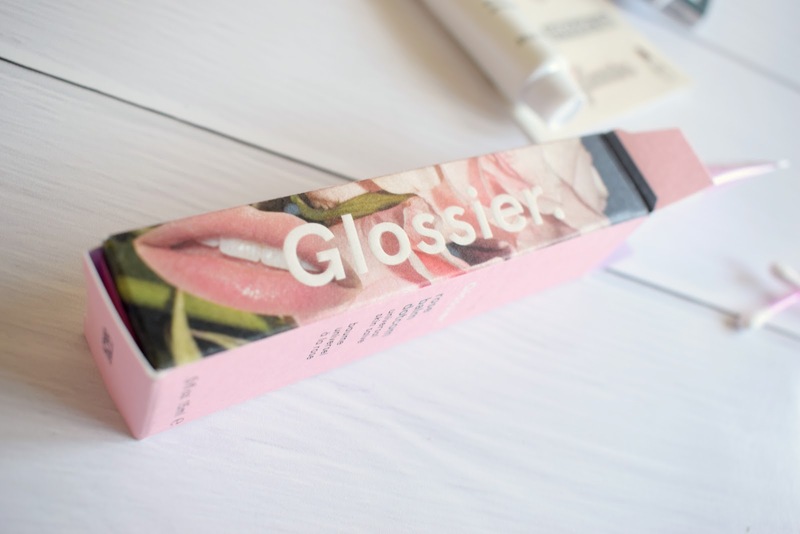 Glossier is one of the cool brands that you always see on Instagram and Pinterest, but never really pay proper attention to. I think that is probably down to the fact that it's only available widely within the US, which makes getting it to the UK a bit of a hassle - and I find that people tend to just ignore brands that aren't fuss-free and readily available on Beautybay or Asos (who have a damn good beauty range right now! ), which is a shame - I really want a UK retailer to start stocking them! Anyway, I ordered my balms via my usual method, MyMallBox. I have a complete guide here, so you can easily work out how to get stuff from the US to the UK (kind of) easily. UPDATE: Glossier now have a UK-based warehouse and ship to the UK. What on earth are you waiting for? 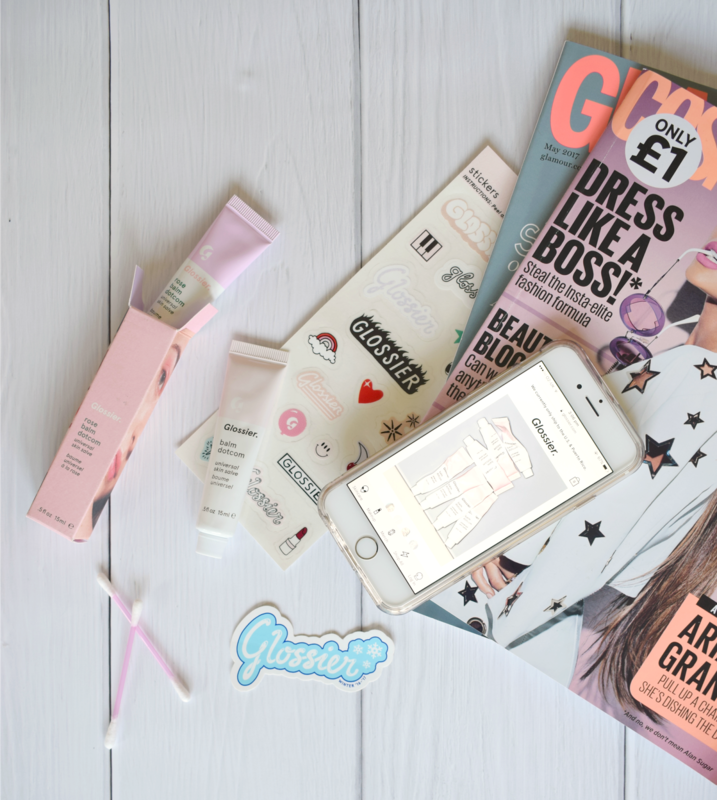 Glossier are all about 'clean' and polished beauty. Their products are super minimal and their branding reflects that. Nope, you won't be getting Mac Studio Fix type coverage from this brand! Nuh-uh. They advertise gorgeous, dewy skin and promote a more natural beauty, which is rather refreshing in a Instagram world full of matte skin and drying liquid lipstick! Their break out product has been the Balm Dotcom. Priced at $12, it's a universal skin salve, and it can be used anywhere - cuticles, lips, elbows.. anywhere that needs a hydration pick me up. It's quite a small tube, (I was expecting it to be bigger) so it's perfect for purses and handbags. You can actually get 20% off your first purchase via a friend referral code - here is mine - so this works out at a pretty decent price. Product claims: "Hypoallergenic, dermatologist tested, long-lasting moisture, paraben free, fragrance-free, cruelty free"
I think that the sightly 'above what you'd usually pay for a lip balm' price is justified for the product after seeing the actual ingredients. It's full of plant oils which are great for hydration and lanolin is a great chapped lip saviour too! Of course, you can go out and buy a plant oil for a little cheaper, but it doesn't stay on for longer than 5 minutes (believe me, I've tried), therefore this is a great all-rounder. I also picked up the flavoured balm in rose. 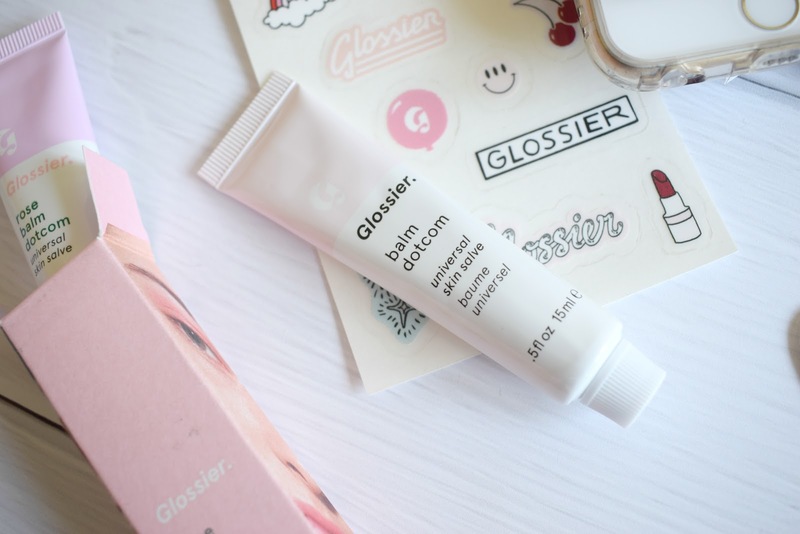 Have you tried Glossier's balm dotcom, or any of their other products? That right there, is 17 year old me, burning away in a tanning bed. It's really easy as someone with naturally fair skin, to want to be tempted to lay in the sun for 3 hours or hop onto a sunbed in order to tan quickly. When the sun and hot weather rushes in and out quicker than you can say 'get the BBQ out! ', us paler girls are always behind everyone else in terms of looking 'healthy' or 'glowing' as some people describe it. We're all wanting to be brown, but what even is brown? Sun damage. Literally. I've always been self concious of my skin tone. I hated my pale skin growing up and I'm still not fond of it now, but looking back, I could slap myself. Why? Sunbeds. They're so dangerous, yet they're the least regulated 'danger' in the UK it seems. From my previous experiences, it's always been young girls working there, or an older lady with a magazine at the front desk that just wants to finish reading the Kim K article, which means they usually don't ever check for ID or advise you to take it slowly. In fact, I was so infrequently asked for any proof of age when I was 17 that it's really quite worrying to think that any young girl can use a sunbed if she pops some make-up on and acts confident - that's really all it takes. A lot of people don't realise that here is no such thing as safe tanning. If you're going brown, that's your skin trying to protect itself against UVB/UV rays. I wish I could have told myself this years ago when I used to leave the sunbed salon smelling burnt. If I didn't climb out of the sunbed smelling that familiar smell - I'd go back in for another 5 minutes until I could smell it. Burnt skin. I cringe at the thought now. Did you guys know that every time your skin burns, it doubles your risk of skin cancer. And just because your skin isn't blistering red, it doesn't mean it hasn't burnt, especially if you're pale. It might just feel a little warm, itchy, tender.. or you may not even notice! UV rays don't just affect skin, either.UV can penetrate deep into the skin's layers and damage the DNA in our skin cells. This damage can happen before your skin goes red or looks burnt. And in case you need it spoon feeding to you, cells that are damaged by UV are at greater risk of mutating and then dividing uncontrollably, which is what happens in cancer. At the end of the day, no amount of £24 Kiehls Ultra Facial Moisturiser or £70 Estee Lauder Serum can save your skin in the long-term if it's damaged by the sun for years on end. We have one skin. We can't replace it or fix it once it's damaged. There are some really interesting studies online where sets of twins have been compared - one a sun lover, one an avid sunblock user.. the results are shocking. Suncream might not be glamorous, and yes, fake tan smells like biscuits and peels off quicker than a natural tan, but looking after yourself in the sun and not using sunbeds are two of the easiest ways to prevent damage to your skin in the long term. "Just getting my skin used to the sun for my holiday!" A few years ago I cringed at the thought of sunbed shops being illegal - they were my stop along the way home every single day after college, but now I can't honestly think of anything better now than just to ban them totally. They are always taken too far by people as it's so easy to get a tan if you have the time and money. SPF is not 'boring' or 'uncool', it protects your skin from irreversible, long-term damage. If I am honest, I wasted an awful lot of money on sunbeds, and it took a long time to build up a tan - it's just not worth it. And even if the expense has to put you off, let it - because unless you have a lot of money every week for a long time to build up a nice layer of sun damage aka tan, don't expect it to be a cheap way of looking cute. UVB rays can penetrate clouds. Live in the UK doesn't mean we're immune to needing sunscreen everyday. So there is my little moan for the year. Just kidding, there will be many more posts in which I write about my frustrations with products, people and other bits and bobs - but isn't that what blogging is about? It's not always flowers and a very cute marble background. Sometimes we really need to touch on the important subjects and inject a little opinion and controversy into the community. So tell me in the comments - do you think that sunbeds have a place in 2017? I would really love to know your point(s) of view!